Andhra Pradesh's Land Pooling Scheme (LPS) was touted to be a model land acquisition initiative. But three years after it was launched, it has left farmers with no land or job. And the rise in living costs has rendered the compensation barely enough to survive. 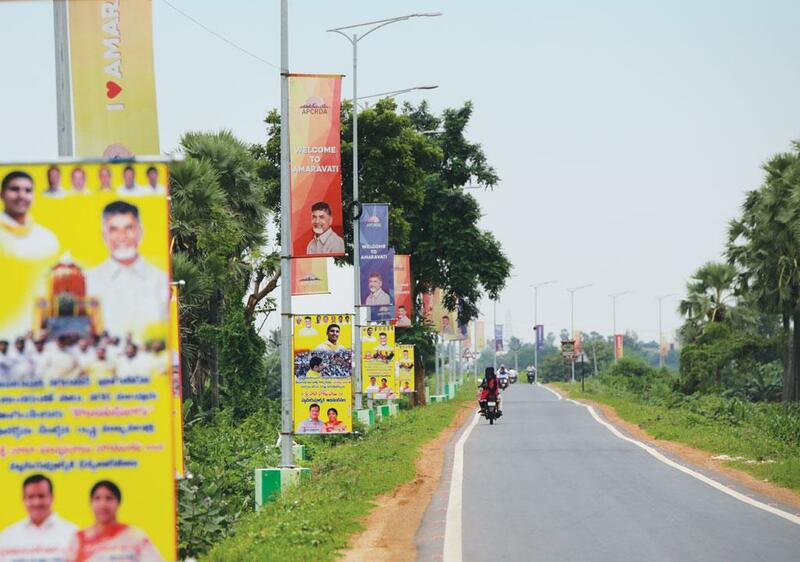 When Andhra Pradesh was divided in 2014 and it emerged that Hyderabad would cease to be the state capital in a decade, Chief Minister N Chandrababu Naidu decided to use LPS over the more stringent Right to Fair Compensation and Transparency in Land Acquisition, Rehabilitation and Resettlement Act, 2013 to acquire land for building a new capital at Amaravati. Between June 2014 and February 2015, over 13,000 hecta res (ha) of agricultural land was “pooled” from over 25,000 landholders in 28 villages. The government opted for LPS because it is much easier to implement. The land acquisition Act requires the government to take consent of 70 per cent of the total affected families for undertaking a public work on agricultural land, but under LPS the government can negotiate the terms of transfer with individual landowners. For instance, Y Lakshmi Narayan, a farmer of Lingayapalem village in Vijayawada district, gave 1.5 ha of his farmland to the government and was promised R2 lakh a year for 10 years (with a 10 per cent annual rise) and return of 30 per cent of his land (which was to be developed to have road connectivity; power, water and sewage connections; and, medical and educational institutions in close vicinity) in eight months. “Initially the compensation money seemed fine, but the government did not take into account the phenomenal rise in cost of living. Electricity rates have more than doubled, from R2.5 a unit to R6, while the cost of rice has risen from R25 a kg to R45. Same is the case with the cost of commute. Earlier, auto-rickshaws charged R150 for a 15 km ride; now they charge R400. Worse, the promised developed plot is not likely to be delivered anytime soon,” Narayan laments. He lost his mother and brother in the last two years and says he spent more than R1.25 lakh on their medical expenses,which have also shot up exponentially. “If the government had provided free healthcare facilities, as it promised, I could have saved my mother and brother, and escaped being neck deep in debt,” says Narayan. Similar is the story of J Suresh of Uddayamrapalem village, who was forced to earn livelihood by becoming a daily wage labourer. Suresh gave 0.8 ha of irrigated land and got R1.22 lakh a year in return. “I had to take care of my six family members with this amount,” he says. There are many others like him who have farming skills, but find themselves unsuited to other profe ssions and end up becoming daily wage labourers at construction sites which are mushrooming after the announcement of the new capital. When Andhra Pradesh decided to have a new capital, the Union Ministry of Home Affairs constituted a committee to look for options. The committee submitted its report in August 2014 and recommended one administrative capital city and development of bigger cities as industrial, investment and technology hubs. It also recommended Martur-Vinukonda-Donakonda region in southern part of Andhra Pradesh for capital and cautioned against building the capital in the well-irrigated, fertile Vijayawada-Guntur region in central Andhra Pradesh, which is used for agriculture. But Naidu ignored the advice. Farmers say they watched while standing crops of sugarcane and maize were uprooted under police protection to make way for buildings. “The cadres of the ruling party spread a rumour that those who do not give up land under LPS would be forced to give it up without compensation. This helped them get land,” says G Naresh Reddy, who owns 0.8 ha in Penumak village but did not give it to the government. He has been organising farmers of Penumak and Undavalli villages to protests against LPS. “We are getting threats from the ruling Telugu Desam Party cadres and government officials to describe our land as dry, instead of irrigated, so that the government can buy it at a lower rate,” claims Reddy. M Seshagiri Rao, president of Capital Region Farmers’ Federation (CRFF), conte sts the claim of LPS being a success and says it violates constitutional rights of the people because it denies them livelihood. CRFF has also filed a complain with the World Bank to stop funding projects in Amaravati. “A World Bank team is visiting next month in response to the complaints to assess the violation in providing resettlement and rehabilitation facilities to the affected people,” claims Rao. He also says that the government might have compensated farmers, but it has no plan for rehabilitation of village artisans and landless labourers. “There are around 140,000 affected people but government took into account only 100,000 farmers,” says Rao. Telephone calls by Down To Earth to the Capital Region Development Commissioner, Sreedhar Cherukuri, inquiring about landowners’ complaints against LPS went unanswered. Several corruption cases have also been reported in the past two years. In August, Y S R Jaganmohan Reddy, Leader of Opposition in the Andhra Pradesh Assembly, raised the issue of arbitrary allotment of land to ruling party leaders and bureaucrats. Remarkably, almost the entire population of the 28 villages where land acquisition is being undertaken belongs to the Kamma caste, the caste of Chief Minister Naidu. Experts say playing the caste card helped the chief minister convince people to give away land. Party leaders from these villages have also been offered posts in the government to manage whatever dissent was there at the ground level. 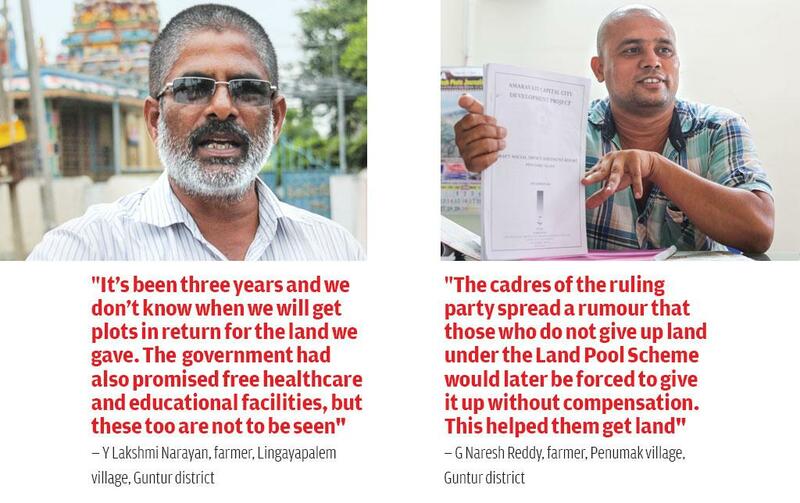 For instance, when this reporter visited Belakonde village in Guntur, marginal farmers were quite vocal about their problems, but big landowners refused to say anything against LPS. “Every-one is happy in this village over LPS. I have contributed my 2.4 ha and am happy,” says P Kotesh Rao of Belakonde village. He also informed the village head, Narsimha Rao, about the arrival of this reporter. “Avoid talking to village residents. I will come and talk you in detail later,” Rao said over phone. “If the chief minister does not deliver what he had promised, the ramifications would be visible in the 2019 Union elections,” warns Narayan. "I have asked the government to re-examine amendments to land laws"
"The new land Bill will displace More people"
The land prices were in range of 10L/acre prior to announcement of capital (more on it later). each farmer got 1200--1450 sq.yards of plot per acre of land given for pooling. the plots have been alloted and layout maps displayed on CRDA website (crda.ap.gov.in). the farmers have been handed over ownership certificates along with the plot codes they would recieve. Using these, their plots can be located on the layout map released by the government. though infrastructure is yet to be developed and plots yet to be physically located, farmers are selling their plots based on these codes by locating them on the layout maps. the prices of such plots today are in range of Rs.12000--Rs.23000/sq. yard depending on the location, proximity to the government city, assembly, start up area to be developed by singapore consortium etc (all the details are available in public domain). price can be verified at http://avenue.in/amaravati-plots/?findplots=crda by double clicking on a plot. plots at lingayapalem village mentioned in the article are selling at around Rs.22000/sq.yard. that amounts to 2.64 cr per 1200 sq yards (which is the size of plot returned to a farmer per acre given to pooling--an increase from 10L to 2.64 cr)). the said farmer having given 1.5 hectares for pooling must have received plots amounting to 4440 sq.yards (whose value in market today is 9.7 cr). He can sell a small part of it for meeting his expenses and make a fixed deposit that would give him regular income (a path which many farmers have taken), more than sufficient to meet the said high costs of living. So the argument that land owning farmers are facing economic crisis is FALSE. agreed, landless labourers might be facing some difficulties. regarding the suitability of the place for capital, on 18-11-2017. the National Green Tribunal has approved the location of capital after thoroughly examining all pleas that urged it to halt construction based on grounds mentioned in the article. so the debate is settled in favour of the state government. regarding the caste angle, the author conveniently concealed the fact that farmers who gave land belong to several caste like kapus, reddis besides kamma. regarding the world bank inspection, the bank has received complaints from some farmers (allegedly instigated by opposition party) and is conducting public hearings. but what the author concealed is, it also received a number of letters from farmers who gave land for pooling, expressing their overwhelming approval of the capital project. the world bank is continuing to fund the project. on the whole, this article doesn't reflect the ground reality and apparently aims at tarnishing the image of government. it is not befitting the stature of a reputed journal like "Down To Earth" to publish this sort of stuff. PS: I'm involved with sale of plots in the said region and the facts stated can be verified. It would be a responsible act on part of "down to earth" to publish the scenario i've mentioned, if found true !! !